Recently, at the day care center where my husband works as cook (Cooker John) they were awarded funds to purchase supplies to create a garden. Maine has adopted the 5210 Let’s Go! Childhood Obesity Prevent Program that works with communities and organizations to change unhealthy eating patterns and promote good nutrition and plenty of physical exercise. The program encourages having a garden in your backyard (or day care playground) so children experience growing and eating what they’ve planted in the hopes they will prefer a fresh salad instead of French fries. (Ummm! tomatoes!) So, when my husband turned to his local librarian to ask for some books on other community gardens, I was thrilled to hand over It’s Our Garden! 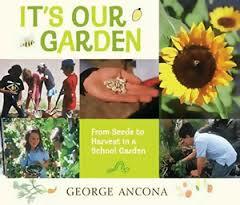 : from seeds to harvest in a school garden by George Ancona. It’s Our Garden provides an overview of how an elementary school in started and now maintains their garden. Ancona is an award-winning photographer who provides readers with a glimpse into the workings of this school garden throughout the four seasons. The idea for the garden at Acequia Madre Elementary School located in Sante Fe, New Mexico was the dream of third-grade teacher, Mrs. McCarthy. She talked to the other teachers, the principal, and the parents, and they all worked together to make her dream come true. Students and the community are involved in every aspect of this garden. From what is planted to the weeding to the harvest. Parents, siblings, grandparents, and other community members are happy to help make this garden a success. Even though the school is closed during the summer, garden chores must continue. As families come together to work, the garden becomes a community-gathering place. It provides a setting for music and gatherings of children, grownups, friends and families. The music fills the garden with joy. A small horno, the traditional oven used to bake bread is snuggled in a corner of the garden. Each spring it receives a fresh coat of adobe. In August it is used to bake yummy pizza. Everything about this book is so appealing. A simple, straightforward text, an abundance of color photos of children helping in every aspect of the garden, and drawings done by the students grace each page. The book is part celebration of the process in creating these wonderful, prosperous gardens at Acequia Madre Elementary School, and also a simple how-to that does answer some basic questions my husband’s day care had about the day-to-day workings of a garden. 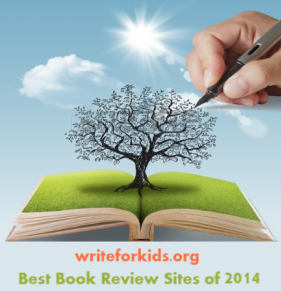 Listed in the book is a list of books from Miss Sue’s Bookshelf and websites of other school gardens. The tone of the book is a mixture of celebration and gentle encouragement. It’s Our Garden is a perfect book to share with students to celebrate Earth Day. IT'S OUR GARDEN. Text and photographs copyright © 2013 by George Ancona. Illustrations copyright © 2013 by the students of Acequia Madre Elementary School.Reproduced by permission of the publisher, Candlewick Press, Somerville, MA. Looks like a great book! I love th colorful photos. :) Thanks for sharing!